Will Kefauver oil painting, "Ashlawn Farm"
Now offering classes in my Damariscotta, ME studio. 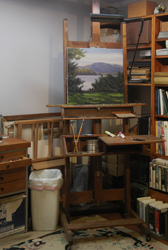 Study the painting of landscapes, the still life or portraits in a comfortable studio environment. Small classes tailored to your level and desires for your own goals. Never more than 6 students at a time. You'll find that you can learn at your own pace and take your creativity wherever it leads you. I won't force my style on you, but guide you through demonstration, suggestion and critique. We'll work together as you explore and develop your own style and technique. 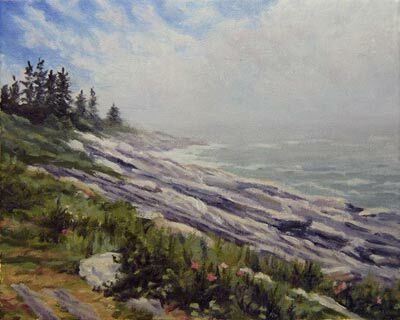 Coastal Maine is a treasure trove of amazing scenery waiting for the plein air painter. Let me guide you to some of this wonder on a painting excursion! Sign up for a 10-week session or just set aside an afternoon to spend in the studio. If your schedule is flexible, mine can be too. You can sign up for a 10 week session and use your hours during any class with available space. Drop-ins — If you'd just like to come by for a session (and I have room that day), stop in for a lesson whenever you have time. "Will has an uncanny knack of zeroing in on the needs of students at very different levels of skill. In the class I had with him, some students had art degrees already and some had never painted before. Will was able to make useful and appropriate suggestions for each person. He is good-natured and enthusiastic, and brings forth the best effort from his students." "Having Will as an instructor was a wonderful experience. He has a way of explaining things that stays with you long after the class. He introduced me to brushes I didn't even know existed and he showed me different techniques with brushes that made me no longer fearful of painting pine trees. I learned a lot in the classes I've taken with Will and look forward to becoming a better painter working with him." "Will Kefauver is a brilliant artist and masterful teacher that brings hope, joy, vision, and inspiration to students of every age. Will instructed my daughter, son, and mother and helped them all paint beautiful paintings that we are proud to have hanging in our home. He is kind, caring, gentle, and insightful as a teacher; and we all feel very blessed to have him in our lives. Thank you Will for showing us that anything is possible and that there is a gifted artist that lives within all of us!" "Will Kefauver is a genius and a truly great artist, and he made me feel like my art work was important." "Will is not only a gifted artist but also an exceptional teacher and coach. To have both these qualities is truly special. Will has helped me to enjoy creating and viewing art far beyond my expectations from six months ago when I started lessons." Learn the basics — from choosing a subject to deciding on the proper composition to ensure a pleasing painting. The sketch — pencil or paint? • What's a thumbnail and why do I care? 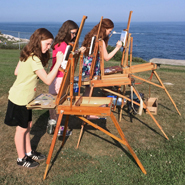 Young students enjoying a painting afternoon at Pemaquid Point. If you've already got some painting under your belt, it may be time to move to the next level. 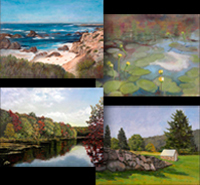 Join me for excursions to select painting locations in mid-coast Maine! Sessions being developed now.